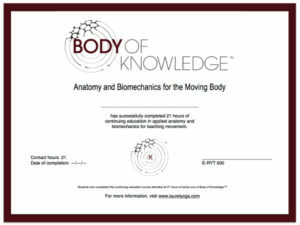 Body of Knowledge™ distills and synthesizes the most relevant anatomy and biomechanics knowledge for practicing students and teachers of yoga asana. The class atmosphere is one of experiential playfulness and inquiry. Hands-on, movement-centered learning governs the majority of time you spend studying anatomy and biomechanics in Body of Knowledge™. In order for this knowledge to stick and be applicable, it must be explored in an embodied way. Anatomy, the study of the names and locations of bodily structures. Biomechanics, the study of the effect that forces, like mechanical stress, have on the ways our structures adapt or maladapt. Kinesiology, the study of movement and the practice of naming it specifically at joints. Physiology, the study of how tissues function in systems, for example, how muscle function depends entirely on the nervous system. Pain Science, an emerging science still heavily researched that looks at how pain is expressed in the body and how our experience of pain is influenced through biological, psychological and social phenomenon. The Joint Play Series is coming soon to YogaWorks Soho, 5 Fridays March 15 – April 12, 3:45 – 5:45pm. This anatomy series will immediately follow a Yoga with Resistance Bands class from 2-3:30pm that explores the targeted joint region exclusively through movement. Information about Yoga with Resistance Bands Joint Series coming soon! While nothing in the body is separate from anything else, when seeking to understand the whole, it’s helpful to look at the parts. Joint Play helps you do just this by putting each of the body’s joints into a ‘petrie dish’ to zoom in on the major structures involved and how they coordinate to allow movement. Explore the foot, ankle and knee joints’ predominate structures and common variations to these structures amongst yoga students, plus how this affects approaching asana. Learn foot, ankle and knee movement capacity, normal end range of motion and the major muscles that move these joints. Gain awareness of the most common musculoskeletal injuries affecting the feet, ankles and knees like plantar fasciitis, ankle and knee sprains, and meniscal injuries. Explore the hip and sacroilliac joints’ predominate structures. Learn common variations of hip structures amongst yoga students, plus how this affects approaching asana. Learn the movement capacity of the hip and sacroilliac joints as well as normal end range of motion and the major muscles that move these joints. Gain a more scientifically complete understanding of what the terms ‘flexible’ and ‘inflexible’ actually mean as well as the implications hypo and hypermobility have for pain and injury around the hip and sacroilliac joint regions. Take a closer look at the major joints, soft tissues and muscles that move the torso including the spine and rib cage. Learn spinal movement capacity, and normal range of motion amongst the different spinal regions. Understand how to improve movement in the areas that don’t move as well and stabilize the areas that move a lot. Learn about muscle ‘slings’ of support that act on the core and that extend well beyond how the core is traditionally defined. Differentiate between the concepts of pain and injury to understand why back injuries and back pain don’t correlate closely, plus an effective movement-based paradigm for approaching back pain using the tools of yoga. Take a close look at the intricate design of the shoulder joint complex and how movement is coordinated between its various bones and joints. Examine the cervical spine and its relationship to the rib cage and shoulder joint complex in posture, breathing and movement. Challenge old ideas about alleviating neck pain and learn effective strategies for improving neck strength for decreased pain and stiffness. Explore key muscles of movement and stability of the shoulders and neck and ways to access these muscles in the asanas for greater stability and control. Take a close look at the intricate design of the elbows and wrists and how movement is coordinated between their various joints. Examine how the elbows and wrists are commonly loaded in the asanas to understand common yoga-related incidences of elbow and wrist pain. 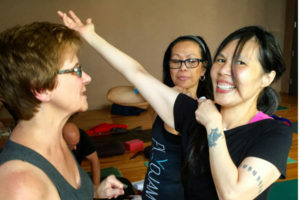 Learn ways to diversify loading of the elbows and wrists in and outside the yoga space for improved function and less pain. Explore key muscles of movement and stability of the elbows and wrists and ways to access them when bearing weight on these joints in the asanas. 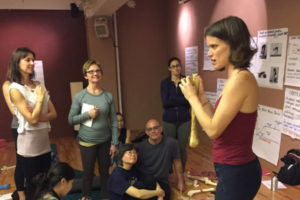 Currently Whole Embodiment workshops are not scheduled for 2019. I am currently working on translating these to online content. Stay tuned! Modules are between 2-4 hours in length and can be taken a la carte or as a part of the whole series. Dip your toes into the topic that most excites or interests you or deep dive into the whole series. Each module is complete in and of itself and no background knowledge of anatomy is necessary. When modules are taken together, knowledge compiles with each previous module setting the stage for a deeper, richer understanding of the the next. You will spend the majority of time applying concepts experientially. Optional home study aids provided. Explore anatomical structures and biomechanical concepts through practice and hands-on engagement. Develop scientifically-informed critical thinking skills to make smart movement choices for your body and work more skillfully with your students in both private and group class settings. 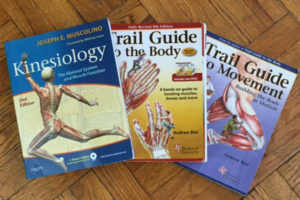 Position yourself as an anatomically-informed teacher to grow your client base and attract students who are seeking your help in better understanding and addressing their specific injuries. Study the body’s hard tissue structure – its bones and bony prominences – as well as how joint surfaces interact in movement. Hands-on explore major joint architecture to learn the significance this architecture has in determining joint mobility and stability. Explore the key biomechanical concepts of load and tissue adaptation to better understand the ways our body’s tissues – namely our tendons, ligaments and cartilage – change in response to the physical stresses and strains we place upon them. Gain a more scientifically complete understanding of what the terms ‘flexible’ and ‘inflexible’ actually mean as well as the implications hypo and hyper-mobility have for pain and injury. Learn about the challenges an asana practice can present for the soft tissue health of hyper-mobile students, as well as some strategies for helping hyper-mobile students improve strength and stability within the practice. Learn about structural variations, or, the inherent differences in bony architecture that makes every body unique. Learn why structural variation matters as a movement teacher or student who takes group classes, specifically when approaches to teaching fail to account for these variations risking impingement and compression of soft tissues. Get a foundational understanding of osteokinematics (movement of bones at a joint) and arthrokinematics (movement of bony surfaces inside a joint) to understand how certain positional goals in poses can cause compression and impingement in the hip, knee and shoulder. Learn muscle physiology by understanding muscle attachments, line of pull, ways muscles contract and the indelible influence of the nervous system on muscle tone, force and firing. Gain understanding of how muscles contract on the microscopic level and never forget why muscles always pull. Learn how muscles coordinate together for complex movement patterns in the body through their roles as agonists, antagonists and stabilizers. Explore the force of breath to learn its influence on the tissues of the core, and conversely, the tissues of the core’s influence on the mechanics of breath. Take a closer look at the major joints, soft tissues and muscles that stabilize the deep core canister, or the “inner unit” and how these muscles play a role in spinal health, pelvic floor health and function, core stability, and breathing. Who Can Take the Body of Knowledge Series? Body of Knowledge consolidates, reviews and then goes way beyond anatomy introduced in yoga teacher training. No anatomy or teaching experience is necessary, although having a dedicated movement practice, like yoga, Pilates, fitness training, martial arts or dance is helpful. How to Take this Series? Modules can be taken together within the series or ala carte, as your schedule permits. Home study assignments are given as optional work to continue internalizing the concepts you spend learning experientially each module. The information in these books will help you to continue to digest and more deeply understand the information imparted in class. If your budget does not permit purchasing them at the time of the workshop series, it should not prevent you from signing up. In addition to suggested reading, optional homework will be assigned between modules to help you apply knowledge and habituate the critical thinking skills each module imparts. Students who complete each series will receive a certificate of completion. Each module counts toward continuing education credits for Yoga Alliance. The number of credits you receive correlates to the length of the module.